June 24, 2017, in Honey Brook, Pa.
"Hank's coming to Penn, and you're going to love him!" Christina's friend Alix said. It was Spring Fling Weekend 2010. Hank, a senior fine arts major at Bowdoin College in Brunswick, Maine, came to visit his high school pal Jay, Alix's then-boyfriend. Alix was right. Christina, a senior history major, and Hank had so much fun grooving to Grateful Dead covers at Alix's party that they left together to talk at Smokey Joe's bar. "We really hit it off over a shared passion for zombie movies," Hank said. Before he left for Bowdoin, she presented him with the book World War Z. With encouragement from friends, Christina, who grew up in Washington Square, invited Hank back to Penn two weeks later for her spring formal. He would come to her Thursday event if she returned to Bowdoin with him for his Spring Fling weekend, said Hank, who grew up in Lake Forest, Ill.
"That eight hours in the car was essentially our second date, and by the end, we both liked each other," Hank said. In Maine, they went out every night, then got up at 6 a.m. to hike. "It was really, really fun," said Christina. Together again July Fourth weekend, they decided to commit, distance be damned. Philadelphia to Brunswick was nothing compared to the geography of plans each had made before they met: Hank was moving to Jackson Hole to work in a ski shop and ski, and Christina to Ireland to earn a master's degree in peace studies from Trinity College Dublin. "It was a little crazy," Christina said. But "he was so different from anyone else I knew." She found Hank's creativity — from his furniture-building hobby to his love of cooking — so endearing. "A lot of what he does was so new to me and so interesting," she said. "Hank is so happy. He loves life." Hank appreciated Christina's smarts and heart. "I tended to be a little more, 'I don't know how I can fix the world's problems.' Christina just gets out there and starts fixing things," he said. Also, "we had this great chemistry where we just loved hanging out with each other, and I didn't want to let that go." She traveled to Jackson Hole twice, he to Ireland once. In between, they Skyped. Hank had a furniture-restoration job lined up for summer 2011 in Brunswick. Since Christina could write her thesis anywhere, they rented an apartment together. When summer ended, the couple moved to Jackson Hole, where Hank worked at the ski shop and Christina a T-shirt shop. She was accepted to the University of Chicago Law School, so Hank decided to earn his master's degree from the Institute of Design at the Illinois Institute of Technology. They moved to Chicago in 2012, and then, in 2015, to New York City, where she became a public defender at the Neighborhood Defender Service of Harlem and he a user-experience designer for digital product-design-consultancy Moment. Recently, Hank accepted a senior user-experience-designer position at Think Co. in Philadelphia, and Christina was hired to clerk for U.S. District Judge Michael M. Baylson. By summer's end, both will have moved from Brooklyn to Philadelphia, neighborhood TBD. In February 2016, the couple traveled to Lake Tahoe for a ski trip and to visit with friends Jenna and Jack. Their friends had to head back to San Francisco one day before Hank and Christina were to go back East. Their first morning alone, Hank was shockingly patient to get on the slopes. "He likes to be the first one out there. But that morning, he was all, 'Take your time. There's no rush.' It was leisurely — and weird." They took chairlift KT22 at Squaw Valley Ski Resort, then hiked to the peak to enjoy the view and a picnic. Hank said: "I pretended I was taking a self-timer photo of us with Lake Tahoe in the background, but I set the camera up to take a video." Camera recording, he knelt and asked Christina if she'd marry him. "Stand up! Stand up!" Christina said. "You have to answer first," said Hank. They had already agreed they would get married after establishing their careers, and Christina said she didn't need anything as old-fashioned as a proposal. That would not have been OK with another important woman in Hank's life. "My mom would kill me if I didn't" propose, he said. Christina said yes, and Hank slipped a new ring topped with a family heirloom on her finger. From atop the mountain, they FaceTimed his parents, John and Bonnie, and hers, Dan and Rebecca. "Then we had lunch and a beer." Christina said, "and skied down together." Christina grew up spending weekends and holidays at her family's Honey Brook farm, where she and her brothers have hosted many summer blowouts. That fun, breezy joy was exactly what the couple, both now 29, wanted for their wedding. The festivities started the day before with lawn games and pizza made in a portable wood-fired oven. The couple provided 20 elaborate tents with most comforts of home so some of their friends could camp together. Some of the Christina Matthias and Hank Garretts guests spent the weekend staying on the farm in a cluster of tents. Saturday first featured volleyball, bocce, and croquet on the lawn, and ziplining, canoeing, and swimming at the pond. The early-evening ceremony began with the couple and their parents walking through an arbor covered with vines and a giant arch-shaped hedge. That landscaping was courtesy of the bride's dad. As Hank said: "It's like Dan has been planning to hold a wedding on the farm for the past 20 years." The bride and groom used a self-uniting license to hold a Quaker-inspired wedding ceremony on the lawn. Her dad explained that anyone who wanted to speak could do so. Some read poems, some offered wedding advice, some told stories about the couple. Hank stepped on a glass in Jewish tradition, in honor of Christina's mom's heritage. Two huge tents accommodated the cocktail hour and reception for 180. There were more games and tours through Dan's hedge maze that led to a couch and a cooler of beer. There was also a ton of barbecued chicken and short ribs and wine. The band played "Dancing in the Streets" for the couple's first dance — a song covered many times by the Grateful Dead. Hank and Christina invited everyone to join them. Hank describes himself as a nervous host, and he worried that some guests wouldn't understand the Quaker ceremony. "But it was like that silence centered everyone," he said. "Our friends said the most amazing things," Christina said. "We could see everyone who was there to be with us, and really take it all in." "It was just so meaningful," said Hank. A bargain: A gorgeous, free venue. The splurge: The tents, furniture, and other rentals it took to make the farm wedding fancy. A two-day mini moon in Montauk, to be followed by skiing in Japan this winter. Officiant: The couple married in a Quaker-inspired ceremony using a self-uniting license. Venue: The bride's family farm in Honey Brook, Chester County. Music: York Street Hustle, Philadelphia. Photography: Asya Shirokova of Asya Photography, Philadelphia. Flowers: Tanti at Papertini, Philadelphia. Dress: Skirt — Stone Fox Bride, New York; top — Lace and Liberty. Hair/Makeup: Daneene Jensen & Associates, Doylestown. 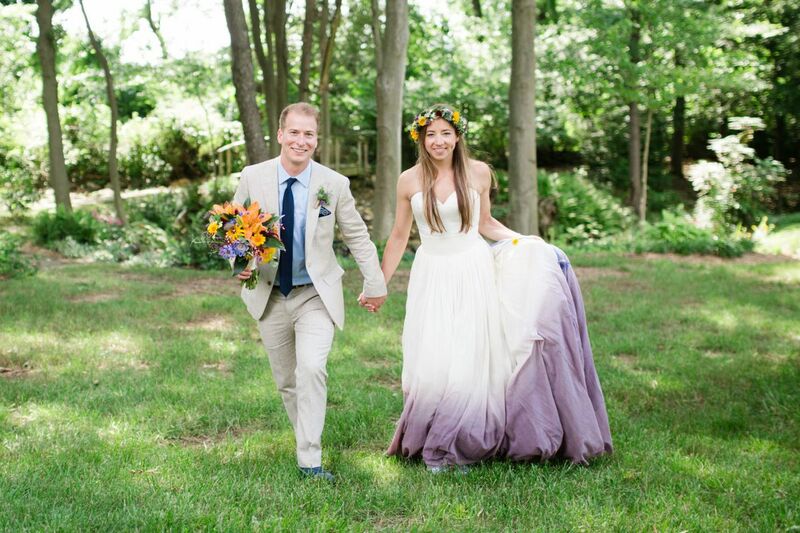 Planner: Lisa Marie Chimento of Kaleidoscope Weddings, Philadelphia. Transportation: Krapf's Coaches, West Chester.